Working as a registered tech in a Veterinary Surgical specialty practice for over 25 years, I have seen many, many disabled pets. 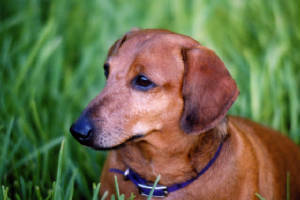 Dachshunds are one of our most common surgical patients. Although the majority of our patients recover their ability to walk post operatively, there are always going to be some that don’t. And, of course, there are those who do not undergo surgery and take the conservative approach to recovery. These dogs in particular need lots of good nursing care and Physical therapy rehab, and once they are healed sufficiently, they need to get up and get active again despite not being able to walk yet. I had long sensed a need for quality, affordable wheels for these pets. Our clients at the hospital often complained about the high prices for the manufactured carts on the market. They simply could not afford them. Their options for their recently paralyzed pets were lacking. I knew I had to do something to help. But, it was not until our own little Dachshund, Penny ruptured a disc in her back and had to undergo surgery that we truly understood how devastating this was. She had such a damaging rupture that she was not expected to walk again and suddenly, I needed a way for her to get around because euthanizing my little life loving, happy dog was just not an option for us. Larry and I just could not afford a cart for her. They were just too expensive. So, this is how we started Dogs to Go! Below you see our sweet Penny. She had her first surgery for IVDD at 3 years of age and her second at 9 years. She is now 16 years old and still going strong. Wobbly, but ready to chase squirrels at any time! I thank my lucky stars every day that I did not listen! She still had life in her, I could see it in her eyes. She WANTED to live! She was NOT suffering. And, it was up to me to help any way I could. PERIOD! Penny came through and fooled even the most confident nay-sayers (including her surgeon). I started her on my own rehab program at home and it worked! She took 5 months to walk again, but she did it, despite overwhelming odds against it. Since then, I have seen thousands of dogs regain their ability to walk again. It takes time and lots of hard work, but it is worth the reward of seeing them take those first new steps again. So, I have learned from her to never give up. To stay positive amidst the turmoil. Keep focused on getting them well again. If you do that, you may just have a little miracle happen like I did! Can’t get any better than that! Larry designed the first Dogs to Go cart for Penny. After much trial and error, he came up with a design that worked for Penny. The moment we put her in it, she knew what it was for. She tested many designs before she told us it was right. Penny was a very active dog before surgery and hated not being able to follow us around in the house and run out in the yard. She was sad and frustrated. Once we found the right combination, she really put the first cart to the test. Full blast around the yard, hunting and sniffing. It did not take her long to master turning and backing. It was like she and the cart were one. We knew at that point we had something special. I talked to my boss at the clinic and he agreed to let me start trying our design out there for our patients who needed carts. For the first year, we made them for no charge, just to get a feel for what we needed to do to make them right. Soon after we started, we were approached by owners of other breeds that also had disabilities. So, we modified our basic Dachshund cart to fit the needs of these other breeds. We saw that there was a BIG need for our simple little product, so we decided to go into business with it. Since that time, we have grown so much, it still amazes me. We now have over 10,000 carts being used worldwide. Many different breeds of dogs use them as well as cats, rabbits, and even skunks. We never thought it would become this! We owe our success to Penny. She has been our love and our inspiration. Through her experiences we have learned so much about the care and treatment of injured and debilitated pets. She is such a little fighter and she has taught me so much about heart. She has made us better. We thank you Penny. Then came Mary! Above is our little Schnauzer, Mary. She is a full time cart dog and she loves her life! Mary suffered an FCE over 12 years ago and she is permanently paralyzed in the rear legs. She uses her Dogs To Go cart every day to patrol our 3 acres. Mary travels to all the doggy festivals with Larry and I. We set up a booth to educate owners about wheelchairs and Mary gives them a show! She just loves the attention she gets when she is in her cart. 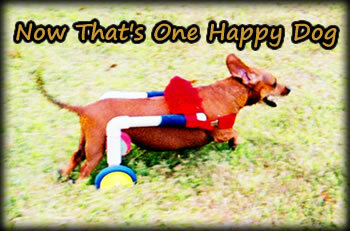 No one in the world could convince me that a cart dog is not a happy dog! Just look at Mary! Mary has taught how well a dog can live in a wheelchair for a lifetime. She greets each day with enthusiasm and energy. She shows the world how normal and healthy a long term cart dog can be! 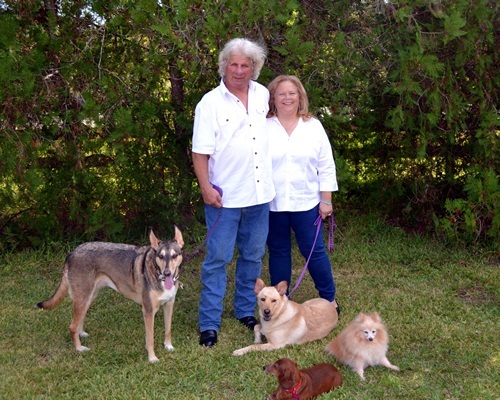 I (Laurie) am a registered veterinary technician (graduated in 1977!) working in a veterinary surgical specialty practice here in Houston. I have worked specifically with disabled pets for over 25 years now and will be happy to talk to you about the special needs of your pet. We have lots of good tips regarding physical therapy, nursing care and just general information about taking care of your recently disabled pet. I have also written a self help manual about caring for your Recently Disabled Pet (available on our Ordering page). It is titled: CARING FOR A DISABLED PET. Larry is our cart builder. 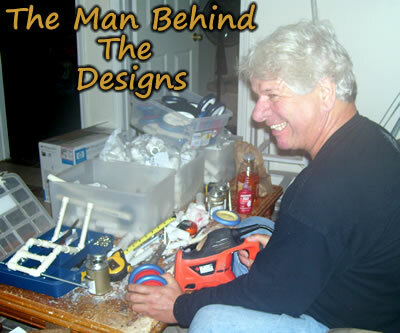 He works a full-time job, then comes home and builds your custom cart. He puts a lot of love into every cart because he knows how much you want your baby to get back to a normal life. He is our true hero. Without his ingenious design, we would not be able to help so many people with their pets. We (the Millers) live on a small farm in Rosharon, Texas. A little town just south of Houston. We are currently owned by 5 dogs and two horses. We have also had two permanently disabled dogs, Penny and Mary (and have recently adopted a new wheelchair dog named Nike) , as well as petsitting many cart dogs in our home, so day to day living with these special creatures is a part of our lives also. 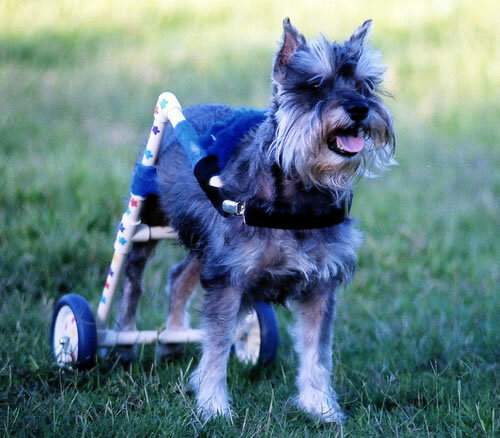 We design walking carts that allow your pet to walk with support, as well as full suspension models that completely suspend the rear feet off of the ground. Both versions are easily converted to be able to switch back and forth if needed. Our carts give your pet the support and security that they need to be able to move around freely again. That makes everyone happy again!